It’s been pretty dry out here in California. The fig tree in the back yard seems to be wilting. It has been doing so all summer. Usually, the onset of autumn begins one or two yellow leaf among the lush green leaves. Today the fig tree looked like yesterday’s limp salad. I began this study by taking off my glasses and working with a charcoal pencil to trace the shadows and the dark leaves. I used a combination of fine-tipped ink pens, colored pencils and gouache to populate the tree with leaves. 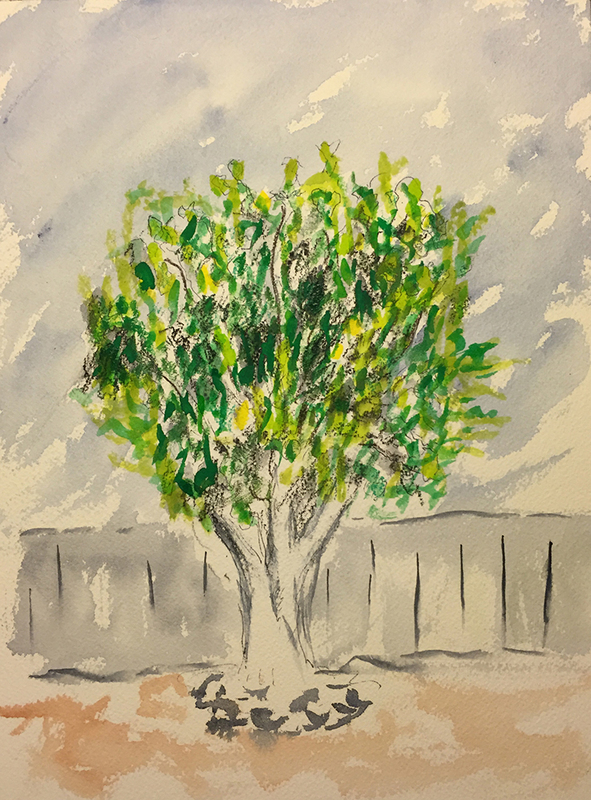 Here are some of the other fig tree studies I’ve done over the years: Vintage Fig Tree, Fig Season Opens, Back Yard, Screened Fig Tree. This entry was posted in Personal Stories and tagged artistic process, autumn, charcoal, colored pencils, creative process, drought, fig tree, sketching, visual arts, watercolor. Bookmark the permalink.